Aurora, CO, September 18, 2018 --(PR.com)-- HCA Healthcare/HealthONE’s The Medical Center of Aurora (TMCA) announced the opening of a new Heart Failure Clinic for patients with congestive or advanced heart failure (HF). The Heart Failure Clinic exists within the hospital’s Center for Lung and Heart Health. Dr. Richard Jantz, a board-certified cardiologist with Aurora Denver Cardiology Associates, is specialized in heart failure and worked with the TMCA team to organize the program. Dr. Jantz, a long-time cardiologist in the Denver metro area, has a passion for treating heart failure patients, having treated many in his 35-year career. The primary goal of the clinic is to collaborate with primary care physicians (PCPs) to co-manage patients with congestive or advanced heart failure, giving them access to care and keeping them out of the hospital. The Clinic will offer patients access to a heart failure specialist in a timely manner. Dedicated nurse navigators will help ensure that patients are compliant with their follow up care by assisting the patients with scheduling appointments, having access to medications, and by connecting patients with the resources they need to maintain their health and manage their heart failure. The Heart Failure Clinic offers a patient-centric multidisciplinary team approach to the management of heart failure patients and gives patients access to other physicians who are part of TMCA’s cardiac and pulmonary teams. These specialists can be quickly involved in the patient’s care if the need arises. Once a patient is referred to the clinic, they will meet with Dr. Jantz. Dedicated Nurse Practitioners and Nurse navigators then navigate the patient through the entire process to ensure that they have the necessary diagnostic testing completed before developing a comprehensive care and treatment plan with the patient’s primary provider. Patients will then be seen on a routine basis in the clinic and as needed to manage the disease and symptoms to keep them living a healthy life and reducing admissions to the hospital. 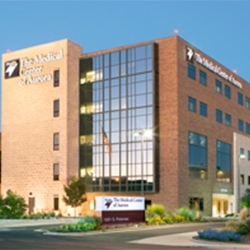 The Medical Center of Aurora offers a full continuum of care for cardiac patients, from prevention and diagnostic testing to surgery and a cardiac rehabilitation program. The facility has an advanced Atrial Fibrillation program and offers the WATCHMAN Left Atrial Appendage Closure (LAAC) Implant for patients with non-valvular atrial fibrillation, cryoablation, RF ablation, and a number of other treatment options for heart rhythm disorders. The hospital’s cardiac program includes an ACC-accredited Chest Pain Center with Resuscitation and an ACC-accredited Atrial Fibrillation with EPS program. The Heart Failure Clinic is located at 1421 South Potomac Street, Suite 315. To speak with a member of the Heart Failure Clinic’s team, please call 303-695-2971.